Carroll and Jose injured, but will it keep them out of Old Trafford opener? | NUFC Blog. Carroll and Jose injured, but will it keep them out of Old Trafford opener? 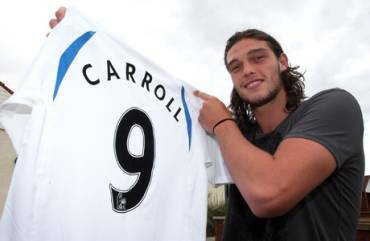 Andy Carroll has withdrawn from the England Under-21 squad for tomorrow nights match against Uzbekistan at Ashton Gate. Carroll came off at half-time with a back injury in the match against Rangers at the weekend, and was closely followed by Jose Enrique who also suffered a some form of knock. There is still a week to go until our opening game of the season, so a lot will depend on the seriousness of any injuries sustained before any panic buttons can start being pressed. They certainly didn’t look like major injuries to me though, but slight niggles can be deceptive, and we already know that Chris Hughton tends not to risk players who are carrying little niggles, unless it is absolutely necessary of course. Losing Carroll would be a blow, but I would suggest that losing Jose Enrique would be the bigger blow. I don’t quite fancy seeing James Perch up against Antonio Valencia in our opening game. I’m not saying Perch can’t do a job for us, but I would feel more confident that Jose, our fist choice/only left-back could do the job better. Common sense really. Carroll would be a miss, but I feel we have players who could come in and do the ‘job’ at Old Trafford. Put it this way, I don’t expect Newcastle to have large amounts of possesion, or a succession of chances so I don’t envisage there being that much of a ‘job’ to do. I’m not being negative, I just don’t think that Manchester United will allow us as much of the ball as we had at the weekend. Confirmation surely won’t be too far away and we should know where we stand with regard to injuries to both Carroll and Enrique. On a kind of plus note, and in answer to my previous article, Alan Smith has been located. Apparently he missed the Rangers game with a ‘slight injury’ but should be fine for Old Trafford. Well considering we’ve only had one left back at the club for the last three years I hope Jose isn’t injured. As well as being our only left back, he’s also our best player. Aye Stuart, I hope I’m not tempting fate but I can’t understand why somebody hasn’t tryed to buy Jose. ye but valencia against perch not good, but i think jonas can run fabio ragged! Please god Jose isnt injured as pointed out he is one of better players and is shocking he is our only lb for 3 years! Agree with Toonsey as I think Caroll is more replaceable. Shola and Loven looked good on Staurday- erhaps this will convince H to go with two up front on Monady. Hopefully it will convince him to get a LB in here. Why they feel the nd to carry 6 strikers and only one true LB s beyond me. im still not convinced in best and ameobi we have the firepower to get goals?? fostino-In short, we dont. Nee offence to either of them but Best and Shola is not a partnership that will find the net regularly in the Prem. Shola and Loven looked canny when they came on at Rangers and I think Mcloven should start on Monday tbh. I’m also bricking it regarding Jose. He has to play and preferrably be 100% fit. Perch looked a nightmare at LB against ‘Gers, god knows what Manure would do to him. We could always play that little fourteen year old laddie who came on for the last ten minutes on saturday. what about Kadar? not ideal I know but still an option. i think that CH is starting to get the arse now with a total lack of transfer activity! For him to come out and say that unless we get more players in we will not cope strikes of a slight swipe at ashley and owl head. with alan smith awol, crap strikers mostly, no LB cover plus a generaly thin squad anyway we are not in the best of shape. severl key players out before a ball has even been kicked adds to the pretty crap situation. there you go lads, only 16 at the time he played here. Fostino…..true but don’t think we’ll be doing much attacking at Old Trafford. We’re looking at a defensive line of Perch-Williamson-colloc-RTaylor at Old Trafford- rather scary. And I’m one of the positive posters on here. I hope Harps gets a good night sleep. maybe kadar could even do what edgar did a few seasons ago …..a fill in l.b. with a long range goal from L.B. against united!! relegation battle all season anyone? With injuries we could be strectched at the back but when we have everyone fit id be happy enough with the cover we have ( bar lb ) . No i dont think we ‘d be i a relegation battle all season craig. do u? Fostino – The three players we lost only scored 16 goals between them in fairness. I understand your point, but I honestly don’t feel that Owen or Viduka are a great loss. Someone kill me now ? Darren Bent ‘doubtful’ for opening game against Birmingham. i was expecting a hatchet job on us there,but i’ve got to say i would be hard pushed to argue against anything in that article.i think it was an honest assessment of where newcastle are,and what there chances are this season. aye I’ve read worse Trojan. TROJAN – I was also shocked to be honest. No bile from Taylor? Wonder if her paymasters have reigned her in? out of our strike force i would only give two of them house room,carroll and lovenkrands,i wouldn’t rule out ranger down the track.messers amoebi,xisco or is it chisco?,leon best i wouldn’t give a ballon for. i cannot understand why there seems to be a sense of near panic ref the Man U game. Lets just tell ourselves we’re going to lose it (quite a lot of other teams will lose there as well) – and anything else is a bonus. I firmly believe that we’re much better set up not to get twonked than we ever have been before. Its only Man U for fecks sake!!! their i meant to say i’ll have the spelling police on my case lol. In fairness to her, it’s a pretty good article and gives a realistic look at the problems we may face. I agree Stu. I think it’s a decent write up. I was just expecting some form of bile from her. It will come no doubt..
We might sneak a draw away at Manure, though as tatty said our season really starts at home to Villa to be fair. Im glad to get the old trafford game out of the way early. Many teams dont start well so lets see. Louise Taylor also made mention of the fact that she wouldn’t be suprised if one morning we were owned by an Arab, American or Chinese. I wouldn’t be in the least bit suprised if that did happen. Not much money spent and I think it’s fair to say that Ashley really doesn’t want to be here anymore than we want him here. First offer and he’ll be oot! Nobody ever mentions Paul Dummet. He is a canny LB at reserve level. Enrique has to play though, anybody other than Enrique would be murdered at old trafford. Raffo……I think Shorey would have been a good buy but as someone said the other day,would he have come to sit on the bench when Jose is fit? Reported as £1 mil loan with option to buy! thats ben afra in the bag, now we need a back up l.b. holding talks! lads i hope other teams dont get involved. fostino – I think houghton see’s perch as being able to cover right across the back four…..hope I’m wrong. Difficult to attract a specialist lb when they will know that jose will always be 1st choice. Looks like we upped our offer. The news over the weekend said we had offerered 500-700K. It will be interesting to see what the purchase fee will be: Will it still be 6M? Will the 1M count towards it, etc? noir9…..CH said on Sky that Perch can play in both full back positions so if I had to hazard a guess I reckon he won’t sign a lb. We need to be looking at players like Van the man who can come in on loan to buys too, who is a LB but can cover LW too. We need to be looking at younger players but in the hope they will challenge Jose. I think he is a cracking player and our 1st choice, but he is only 1st choice as theres noone else. We need healthy competition and he needs to be challenged to perform to keep his place. The same goes for Nolan et al. There shouldnt be ANY in the first team who are nailed on week on week. The same goes for Jonas, who will now have to up his game if we get in Arfa as he is another who isnt challenged and gets away with very little creativity. lets get him on board lads b4 we talk about other things.great if he signs we will have the best winger in the league if he puts it in.if he does then watch every team going for him.then are option would be in trouble.but if we give him support the pull of are fans is the best.so no slagging him off if he is going throu a bad spell. exactly mate,that’s why I wouldn’t want to loan a player if you have to guarantee them a game.Every player should have to earn the right to play no matter who they are………I know it’s not always like that but it should be. Not so fast, Trojan! “Messers” should be “Messieurs”. Inspector Worky of the Spelling Police. Aye Asim,wait until it’s done and dusted before we celebrate.Like I’ve said before if you want to see wingers take on players and do the tricks you also have to be prepared for them to lose the ball quite often too.I just hope if he comes and does well we get him signed up permanently asap. Noir9@66, That doesnt surprise me at all, he hoyed his toys out the cot regularly at the toon when returning from injury instead of fighting for his place like a man, over rated prima donna. To be fair to Given though, i thought he shouldve gone to Arsenal when he left us. Seems the pay check was too much to resist eh?! News about ARFA is on Sky Sports too. Looks like it will happen now. I am still not believing it 100% . But if it happens then its great for us. We will have then few players in our team which are best in their positions in PL. My only concernis when SSN ‘understands’ something it means nothing. SSN have been made to look like plums before so I will wait. I have to say I did like the feeling when the routledge signing happened, absolutely no idea where it came from right outa the blue. Fantastic. i wasn’t me i’m not guilty guv’nor. that new blue away kit oh the photos there,is hanging like a pair of lace curtains. I’m never confident when it comes to us and signings. If we have the option to buy next season, will we buy him for the quoted £6m? Not sure were going to be spending money like that. Hope we’ve got that in writing, if he has a storming season he’ll be worth double that. What position does he play this gadgie? he can play left and right wing,also num 10 role Stu. I cannot see him playing on the wings like, not with Routledge and Jonas. Probably play him in the number 10 role I imagine. We do need a creative player in the middle. Stu – There is always a chance, but remember he is still on a Marseille contract at the minute, we/any club just those wages, at that level. It is an interesting situation as O’M will lose a load of money if this loan to buy agreement is sewn up tight by our people, which sounds crazy just writing it!!! I can see him having a stormer and us having to stump up 10million to keep him as Owl head didnt write the agreement properly!!! Now then chaps, don’t get carried away with Lousie’a Guardian preview @31……. this one appeared in the paper’s little Prem preview supplement today. That’s more like Ms Taylor… atta girl! Ps…. the rest of the teams are previewed in the same vein – with big tongue in big cheek! I really think its fantastic that our U15s did as well in their recent tournament. Capped by the fact that ginger star Adam Campbell won the tournaments MVP (most valuable player). I thought it was a piss take when the NUFC.co.uk site said that previous holders of that accolade were Iniesta, Tevez and Torres. Thats exalted company. I’d far rather we were able to nurture latent talent like that through our own academy than go and sign some tw*t for millions and a huge weekly wage that he’ll no doubt piss up the wall. All the best son!! – congrats to Willie Donnachie and crew as well! @87 Raffo – I read that about O’neil & it does sound as if someone knows whats going on at villa or maybe its because its not written in the usual text speak that makes sound possible. He didn’t exactly commit himself to them at the end of the season. Young & Milner sold & O’neil walks….think thats called karma or something. @89 Aye lesh – I was spiting blood until I read some of the other teams previews, quite funny really. Villa Website have confirmed M O’Neill has quit with immediate effect. Interesting call by Martin O’Neill…seems as if the lad doesn’t take sh**t…no money to spend…see ya !!! About LB issues: Kadar can also play LB, aldo i admit, hes not the best at attacking, but after Jose Enrique, hes the clubs best LB. Decent performence, maybe wont give in too much crosses, but capably of stoping Valencia. Strikers: After LB, its the clubs weakest spot. None of our strikers are PL class, none of them played well at this level, or scored lots of goals. Our MF is good for the PL, but we need at least one striker next to Caroll to score. I would really look for a loaned player from the top 4, like Wellbeck. Too high class players wont come as we cant pay them, but we dont need Keane type players, we need middle class players or highly motivated youngsters.